One of the questions we regularly field is: “How much does a timber framed home cost?” Our answer is generally that we don’t know. In nearly thirty years of doing this we have found that there is no simple answer to this very basic question. There are just too many things that have to be defined and decided before an accurate cost can be projected. A complete and detailed design is the minimum requirement for beginning the process of fixing costs. That being said, we can offer you some general parameters to consider. The first thought to keep in mind is that a timber framed home will likely cost more than a similar sized home built conventionally. 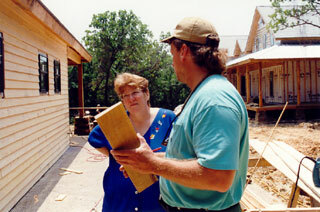 There is no good prediction as to how much more as we don’t know the quality of the conventional home being discussed. If you are trying to compare the cost of a timber framed home to a typical “tract” home built by a large volume builder the cost could easily be double. If you are trying to compare the same timber framed home to a custom built, custom designed home with high-end appointments then the costs might be comparable. Based on the prices for conventional homes we see in our East Texas region, the cost of a 2,500 square foot timber framed home in East Texas could range from $400,000 to $750,000. A second thought to keep in mind is that an entire home need not, and probably should not, be fully timber framed. Simply put, there are areas in a home where the timber frame really shines and offers the highest value. These are generally the public areas of the home such as the kitchen, dining room, living room or great room. Similarly, there are areas in a home where the timber frame adds cost but does not add visual or financial value. Those are generally the secondary areas like bedrooms and utility areas. By limiting the timber frame to those areas where it does the most for the home and its occupants you can lower the cost of the entire home while getting the timber framed look and feel you are looking to achieve. And finally, keep in mind that many items beyond the timber frame, and potentially structural panels (SIP’s), have considerable impact on a home’s cost. One simple example is a fancy, industrial quality range for the kitchen could easily add $3-5per square foot to the cost of a 2,500 square foot home. There are many items that follow the same pattern if to a greater or lesser degree of impact on the budget. Each has to be addressed as the design and project move forward. Some items may well be upgrades you can consider at a future date as funds are available and others are items integral to the structure that cannot easily, if at all, be changed in the future. Our view is to not compromise on the quality of the structure and plan for upgrading appointments in the future if the budget to do both initially is not available to you. The next phase is starting the work and that is done through contracting.